This was a fascinating article from the Boston Globe about the economist Minsky and his theories on capitalism. Too bad he has a Russian name because it is too easy to associate that with the failed Soviet Union and communism, but far from it, Minsky, as I understand it, believed in capitalism but feared the financial industry. He warned about what would happen if the financial industry went unregulated and actually detailed what happened to us over the last few years. He actually warned about exactly what happened to the US and other countries as they depended more and more on leverage and increased their debt. Our financial system evolved into a giant Ponzi scheme that put Mr. Madoff to shame. Free and unbridled capitalism seems to be self destructive and the purists who believe that the free market can solve anything are just plain wrong. Anyone who still believes that after the collapse we have suffered is just living in denial. The trick is finding the balance between competition and regulation. Too much of either is dangerous. The link above takes you to page 4 of the piece in the Boston Globe because key points are made there that apply to our situation today, but I recommend after reading it that you jump back to page 1 and read it all the way through if you have time. The rain band near the equator that determines the supply of freshwater to nearly a billion people throughout the tropics and subtropics has been creeping north for more than 300 years, probably because of a warmer world, according to research published in the July issue of Nature Geoscience. If the band continues to migrate at just less than a mile (1.4 kilometers) a year, which is the average for all the years it has been moving north, then some Pacific islands near the equator -- even those that currently enjoy abundant rainfall -- may be drier within decades and starved of freshwater by midcentury or sooner. The prospect of additional warming because of greenhouse gases means that situation could happen even sooner. The findings suggest "that increasing greenhouse gases could potentially shift the primary band of precipitation in the tropics with profound implications for the societies and economies that depend on it," the article says. "We're talking about the most prominent rainfall feature on the planet, one that many people depend on as the source of their freshwater because there is no groundwater to speak of where they live," says Julian Sachs, associate professor of oceanography at the University of Washington and lead author of the paper. "In addition many other people who live in the tropics but farther afield from the Pacific could be affected because this band of rain shapes atmospheric circulation patterns throughout the world." * Magazine issue 2725. Subscribe and get 4 free issues. The four-day week could boost employment, save energy and make us happier. FANCY a three-day weekend - not just once in a while but week in week out? You may think your bosses would never agree to it, but the evidence suggests that employers, employees and the environment all benefit. The four-day week comes in two flavours. One option is to switch from five 8-hour days to four 10-hour days, meaning overall hours and salaries stay the same. In August 2008, the state of Utah moved all of its employees, apart from the emergency services, to working 4/10, as it has become known. The hope was that by shutting down buildings for an extra day each week, energy bills would be slashed by up to a fifth. The full results of this experiment won't be published until October, but an ongoing survey of 100 buildings suggests energy consumption has fallen by around 13 per cent. The survey also found that 70 per cent of employees prefer the 4/10 arrangement, and that people took fewer days off sick. The second form of the four-day week is to work the same number of hours per day for four days only, with a commensurate 20 per cent pay cut. With the recession hitting revenues, accountancy company KPMG announced in February that it was offering its 11,000 UK employees the option of a four-day week to avoid job losses. So far 85 per cent of employees have applied to join the scheme, and 800 now do a four-day week. * Magazine issue 2726. Subscribe and get 4 free issues. If you have ever taken a stroll through an old graveyard, you may have winced at the surprising number of tombstones bearing witness to the young age of their occupants. In the past, around 1 in 3 children died before their fifth birthday. It was common for children to perish from diphtheria, measles or whooping cough, to be paralysed by polio or to be born deaf and blind from congenital rubella. Now fewer than 1 in 150 children die before age 5 in developed countries. Much of this is down to better sanitation and nutrition, but a large part of the credit must also go to vaccines. Despite this, some parents are refusing to allow their children to be vaccinated out of fear that certain vaccines cause autism, or that combined vaccines against several diseases overload the immune system. Vaccines can cause side effects, and a few have had such serious effects they have had to be withdrawn. However, any side effects are usually minor, such as a fever, and have to be set against the risks of the real disease. What's more, study after study has shown that autism is not more common in children who are vaccinated. And children can respond to an estimated 10,000 immune challenges at one time - a good job when you consider the maelstrom of microbes they encounter in every speck of dirt. Similarly, what Americans often consider a single unique system of health care is an illusion: we exist in a sea of not-so-unique alternatives. Like the citizens of Germany and Japan, workers in the United States share insurance premiums with an employer. Like Canadians, our older, destitute and disabled citizens see private providers with the government paying. Like the British, military veterans and Native Americans receive care in government facilities with the government paying the tab. And like the poor around the world, our uninsured pay cash, finagle charity care, or stay home. Our archipelago of plans means that those safe on a good island with good insurance can be delighted with the system, even as millions of invisible fellow citizens tread water or drown offshore. It means that those on a mediocre island are stuck there. It also means that not one single piece of the infrastructure — like record keeping, drug pricing and administrative costs — can be streamlined across islands in any meaningful way. Hence the expense, the inequity and the tragedy. Can we ever repair the damage to our planet? (AP) Cleanup of the most polluted sites in the Great Lakes is moving so slowly it will take 77 more years to finish the job at the existing pace, according to a federal report. First the governor of my home state goes AWOL for a few days for a hottie in Argentina. This is a guy who is married with children. He disappears saying he was "going hiking on the Appalachian Trail." When I say disappeared I mean it. No one knew where he was. No phone numbers, no addresses, no way to get in touch and he was gone for at least four days with out anyone knowing how to get in touch with him. Sad, because he seems to be a fairly nice person but hopelessly out of touch with reality. Then, Senator Joe Wilson from South Carolina makes us proud by shouting out, "You lie" at one point during the president's speech. There was also some heckling from other members of the sad gang of naysayers that our GOP has become. I tried to go to Wilson's web site at http://www.joewilson.house.gov/ to register my complaint. My hope is that it is because so many people are complaining to him but my fear is that it is because so many people are trying to congratulate him. I really have no way of knowing but I for one will keep trying to register my complaint. South Carolina is a beautiful state and I would like to be proud of it but if those who represent us on the national stage continue to show such juvenile behaviors I fear that my pride is crumbling. This is the first time I have read a serious analysis of why people fear government and exhibit such irrational behavior at public meetings. Usually critics just put them down as "crazies" but this author takes a serious analytical approach as to why they behave the way they do and why there is such a widespread fear and distrust of "government." A lot of heavyweight thinkers have offered explanations of the irrationality of modern political behavior -- you know, behavior like Medicare recipients at town halls screaming about the evils of government-run health care, or otherwise-reasonable people likening President Barack Obama's plan to Nazi eugenics. I believe this is the apartment building we lived in when my ship, the USS Peregrine, was in overhaul in the Bethlehem Shipyards in San Francisco, California. We used to live upstairs over this store when I was in the Navy. The entrance was in the center where the indented doors are. You walked through a courtyard and then up some stairs. No air conditioning. Jalousie windows. This was when I was on the USS Peregrine. I am now reading the Alex Rutledge series of detective stories written by Tom Corcoran that take place in Key West. It is fun to read about all the places I used to know and visit. This was my home when I was growing up. I lived here until I finished college and joined the Navy. What does a blog about sailing vessels, what people do with trash, and an airplane nicknamed "Rivet Ball" have in common? As always truth is stranger than fiction and as is often the case these days Facebook plays a role. My cousin, Robert L. Brown, a retired teacher, active historian, and former Air Force Officer was at one time a crew dog on a plane flying out of a small island in Alaska, an island called Shemya. "Rivet Ball" flew out of the single runway on Shemya and along the Russian coastline capturing electronic intelligence and evidence of Soviet ICBM launches. The weather was terrible and landings were always a challenge. On one of those landings in bad weather "Rivet Ball" encountered slush and ice on the runway preventing the braking needed to stop. "Rivet Ball" slid off the end of the runway and ended up a twisted and broken bird but her crew escaped with minor injuries. King Hawes and my cousin were fellow crew dogs on the broken plane and have remained friends ever since. Recently I encountered King on Facebook and knowing the connection to my cousin we became Facebook friends. It was then that I learned that he has some very talented daughters, the youngest, Karen is maintaining a the blog Open Waters where she is documenting her experiences on the sailing brig Kaisei. The excerpt below is from her blog. Just a quick update, because internet access is a little iffy out at sea. 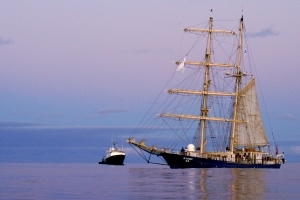 . . I’m traveling west and north, on the brigantine Kaisei – a tall-mast ship with Ocean Voyages Institute. We’re over 1,000 miles from nearest land, taking a short swim break in the deep waters. The crew of 25 are enjoying a much-needed break from the long days and short nights – or long nights and short days (depending on what shift you’re working)! I’m onboard as the medic, engineer, and computer geek/website assistant to the blog for Project Kaisei – Sailing Vessel Kaisei. There’s a second ship, the New Horizon, which is also working with OVI on Project Kaisei. Obviously, I’m also onboard for my exploration of trash, for Trash Trip. The fact that I’m out at sea, searching for the plastic vortex of trash, is a dream come true! I have known about the gyre but never imagined it possible to reach. We have seen plenty of bits and pieces of trash along the way but we have yet to encounter the elusive island of floating trash. The gyre is a big place and we’re a small vessel. If and when we do encounter it I can only imagine how that will feel! Florida decrease in population a good thing or bad? In my humble opinion this could be, in the long run, the best thing that has happened to our state in decades. The reality is that no society can live on growth forever. it doesn't take a rocket scientist to figure out that we live with limited resources. Food, energy, water, all are limited. We have been living beyond our means for half a century now. It is time for Florida, the US, and the world to stop counting on growth to pay for everything and for everyone to realize that there is a certain population that is sustainable. We passed that level a very long time ago and the continuing degradation of our environment is the result. Last month came the most jaw-dropping announcement of all: The state that made population growth the linchpin of its economy for more than 60 years lost a net 58,000 people this year, according to newly released estimates for April 1. "It's the end of an era," says Robert Lang, director of the Metropolitan Institute at Virginia Tech. "Florida represents an entire postwar vision of the good life — palm trees, low cost and no taxes, just easy living. They could turn it around, but in the short haul, it's paradise lost."